In much of the country, December is a very cold time of year. But it is especially cold for those who are experiencing homelessness. According to the Annual Homeless Assessment Report by the U.S. Department of Housing and Urban Development (HUD), 610,042 people were homeless in Jan. 2013. Of these people, more than 215,000 were living in unsheltered locations. The HUD also estimated that nearly one-quarter of the people experiencing homelessness were under the age of 18. These numbers were calculated by taking a single-night count, and the numbers may fluctuate from night to night or month to month. Homelessness is a complex problem and there are many factors that lead to homelessness. However, there are ways that everyone can help make a difference during the holidays and at any time of the year. In the U.S., there are many programs and homeless shelters that are working hard to bring an end to homelessness and find permanent solutions for people who experience it. One simple way that you can make a difference in your community is to volunteer at a local homeless shelter. 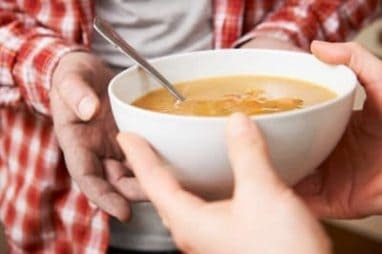 Many shelters have soup kitchens throughout the colder months, and these kitchens may be looking for volunteers around the holidays. We’ve compiled a list of just a few shelters and programs that may be looking for volunteers. Keep in mind that these programs can likely use volunteers year-round. The holidays are a great time to start volunteering, especially if you want to help out with holiday meals or have a New Year’s resolution to give back to your community. If you live in one of these areas and are looking for a great way to give back, consider donating some of your time! Fresno Rescue Mission – Fresno, Calif.
DC Central Kitchen – Washington D.C.
Open Pantry – Springfield, Mass. Feeding America – Tampa, Fla. It is a good idea to call ahead to make sure volunteers are needed on the night you would like to volunteer. If you don’t live in one of these areas, you can find soup kitchens, food pantries, and food banks in your area using the Homeless Shelter Directory. To find shelters in your area, just click on your state and find the nearest town in the list. At Wheels For Wishes, we love sharing uplifting stories from our partner Make-A-Wish. This story about Wish Kid Natalia is sure to warm your heart and get you in the giving mood! Natalia’s wish was to help people by working with a chef to make a soup recipe. Her wish came true when she served her soup to more than 150 homeless people at the Drop Inn Center in Cincinnati. Through her wish she was able to bring warmth to many people in her community and inspire others to give back as well. If you’d like to help more wishes come true, consider making a vehicle donation through Wheels For Wishes benefiting Make-A-Wish. Donating a car is an incredibly generous way to help someone in your community have a great reason to smile this holiday season! The proceeds from auctioning or recycling your donated vehicle will go to your local chapter of Make-A-Wish, helping them to bring hope, strength and joy to a child in your community! Donating is easy and we take care of all the work for you. If you’re ready to make a donation, simply give us a call at 1-877-431-9474 or take a moment to fill out our easy online vehicle donation form. You’ll feel great about giving back!